Start Bay forms an important and attractive element of the South Devon coast. The major east-facing coastline in Devon, it occupies the great sweep between the Dart Estuary in the north and the jagged headland of Start Point in the south. As with the rest of Devon’s coast, it is followed faithfully by the South West Coast Path. 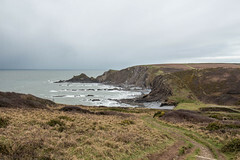 This walk explores part of the inland landscape behind Start Bay, using the Coast Path to return to the starting point. 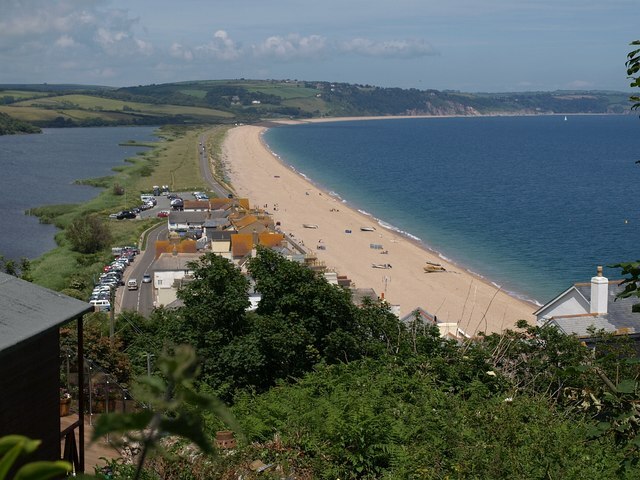 It is based on the village of Torcross, at the southern end of one of the features which makes Start Bay so unusual, the freshwater lake of Slapton Ley, separated from the sea by a narrow strip of shingle. 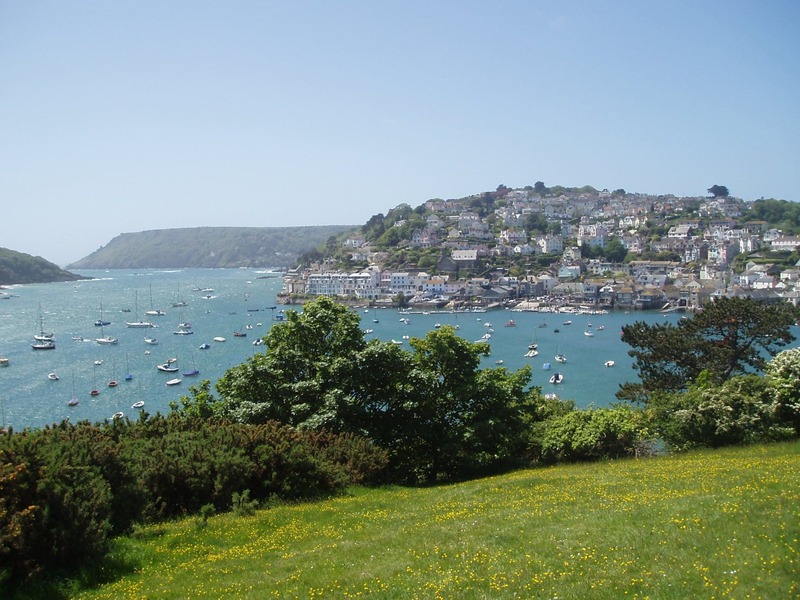 Torcross is accessible by the regular, and very scenic, bus service between Dartmouth and Kingsbridge; some buses continue beyond Kingsbridge to and from Plymouth. Torcross : pubs, cafés, shop, toilets, car park, buses; Beesands : pub, toilets, car park. Five stiles; two climbs, one of 50m/165 feet, one of 70m/230 feet, but neither of which are especially steep or onerous. Explorer (1:25,000 scale) no. OL20 South Devon. Landranger (1:50,000 scale) no. 202 Torbay and South Dartmoor. 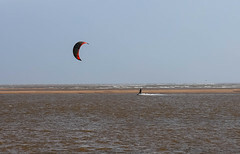 During World War 2, Torcross was the base for Exercise Tiger, when American troops used the area as a practice for the D-Day Normandy landings. During the exercise, many lives were lost when the troops were attacked by a German gunboat. In 1984, a Sherman tank, lost during this disaster, was raised from the sea and positioned at the village end of the car park. Have a look at the tank and the information boards before embarking on your walk. 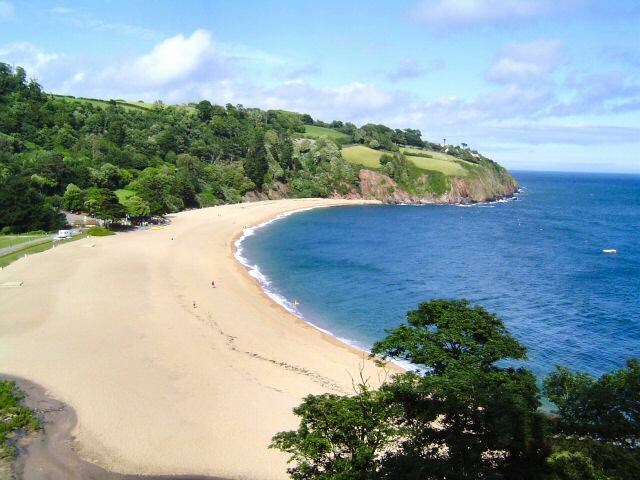 Slapton Ley is the largest freshwater lake in South West England, separated from the sea by a narrow shingle bar. The bar has been raised by rising sea levels over the 10,000 years since the last Ice Age. A variety of streams feed the Ley and there is an overflow tunnel and weir to control the level; this was constructed in 1856 to prevent flooding. 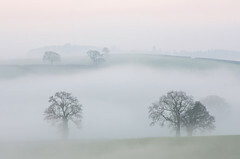 The Ley is extremely important for a variety of wildlife and has been designated as a National Nature Reserve. Numerous information boards around the Ley give details of the wildlife interest. One of the paths along the walk was set up by the Parish Council, with the help of South Hams District Council and funding from a Lottery-backed project called Life into Landscape, with the co-operation of local landowners. The first stretch is alongside the road, so take care if walking with children or dogs. The shallow valley of one of the streams feeding the Ley. A new pond has been created here to enhance the wildlife value of the area even more, and has been successful in encouraging dragonflies. On the far side of the little valley can be seen Stokeley Barton, originally an 18th century farmhouse. Stokenham church present building dates largely from the 1400s however there was a church on the site in the 1100s, with restoration having taken place in the 19th century. During the exercises for World War 2 the whole area had to be evacuated and at that time some damage did occur to the church, although most of this was relatively superficial. Stokenham is a very picturesque village and you may wish to turn right next to the church to look at its attractive cottages and the 17th century Tradesman’s Arms. Alternatively, of course, a break may be taken at the Church House Inn. Initially the byway is cut deeply into the surrounding landscape, the bedrock forming the surface of the track. The South Hams is criss-crossed by a quite extensive network of these so-called green lanes, affording an ideal way to explore the countryside in a quiet and unobtrusive way. They also act as important wildlife corridors. 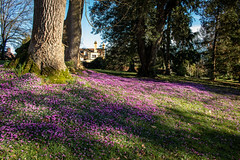 Widdicombe House is part of the estate although the house is not visible from the path, it does have a number of claims to fame, including that it was said to have been once owned by Captain Cook, the explorer. 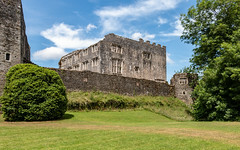 More recently the house and the estate was used by General Eisenhower during the Second World War as his headquarters and as a centre for US servicemen while they were in the area training for the D-Day landings. Superb views open up over the Widdicombe Valley. The valley is drained by a stream which is blocked off from the sea by another shingle bar which creates a smaller version of Slapton Ley. This, Widdicombe Ley, will be seen later in the walk. On the opposite side of the valley is the little village of Beeson. More a hamlet than a village, Beeson has a number of 18th century farmhouses. Like so many of the earlier settlements, it was established a little way inland, out of the way of both storms and pirates, both of which could be deadly. There is also a good view along the walk around the southern end of Start Bay to Start Point and its lighthouse. The point gets its name from the Saxon word “steort”, meaning a tail, and a very good description it is for the distinctive jagged headland. The whole sweep of Start Bay is very vulnerable to easterly storms and that is the reason for the boulders being positioned along the top of the beach since they offer protection for the low-lying area behind. The walk now returns to Torcross along the South West Coast Path, guided by signposts and the National Trail acorn symbol. Beeson Cellars the original site of the fishing settlement. Now superseded by Beesands, the spot was once renowned as a centre for crabbing. 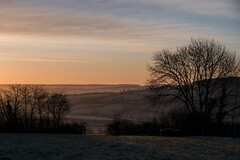 Towards the top of the climb there is an excellent viewpoint, showing Widdicombe Ley, the whole valley and Beeson and the sweep of the bay down to Start Point. At this point the path is inland of an old slate quarry. One of the several such quarries formerly found in the area, it was worked from the 1300s until the 1800s. Records show it was offered for sale in 1855 together with a steam engine, slate planing machine and pump. Production stopped when higher quality Cornish and Welsh slate became more widely available. As the path descends the sweep of Slapton Sands and Slapton Ley come into view ahead. This is a particularly good vantage point to appreciate the scale of the shingle ridge, known locally as the Slapton Line, and its importance as a means of communication to and from the area following the building of the road in the 1860s. Torcross grew in the 19th century as a holiday destination – notice the date on the Torcross Hotel on the left. It has also had its share of storm damage over the years, and the modern sea defences dating from 1980 are testament to the need to prevent such occurrences.